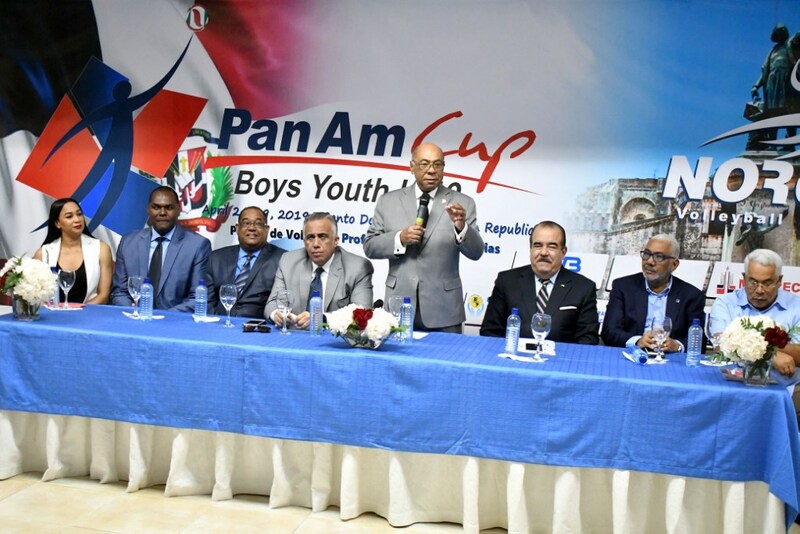 SANTO DOMINGO, Dominican Republic, March 25, 2019 – The U19 Boys’ Pan American Cup, a competition offering two tickets to the FIVB World Championship of the age-group, will take place in Santo Domingo from April 22 to 29. The announcement was made in Santo Domingo on Monday by Cristobal Marte Hoffiz, president of the NORCECA Confederation. Five countries have confirmed their participation as up today. They are: Canada, Cuba, Mexico, Puerto Rico and host Dominican Republic. The U19 FIVB World Championship will be held in Tunisia from August 21 to 30. The members of the Organizing Committee led by Dr. Milton Ray Guevara, president of the Constitutional Tribunal of the Dominican Republic were introduced during a press conference held at the premises of the NORCECA/FIVB Regional Development Center in the Dominican Republic. The Pan American Cup offers one ticket to the NORCECA top ranked team among those not already qualified plus a second ticket to the top ranked team no matter its confederation NORCECA or South America. This will be the third edition of the U19 Pan Am Cup. The first two were disputed in 2011 and 2017 with Brazil and Mexico the eventual champions.